ISLAMABAD, Pakistan (CNN) -- At least 33 people have been killed during massive clashes between pro-government supporters and opposition party members Saturday in the southern Pakistani city of Karachi, police and intelligence sources said. Many of those killed were supporters of deposed Chief Justice Iftikhar Chaudhry, who had gathered as he arrived in the city earlier in the day, police said. An unknown number of other people have been wounded. Pakistani President Pervez Musharraf removed Chaudhry from his post on March 9, accusing him of misusing his powers. The dismissal has sparked widespread demonstrations. Chaudhry was slated to address a bar association meeting in Karachi, but because of the upheaval was not able to leave the Karachi airport. He was flying back to Islamabad. Musharraf, meanwhile, held his own public rally in Islamabad as a show of his strength. "My head is held up high," the president told a cheering crowd. "Love for the people is in my heart ... The strength of the people, of the Pakistani people, is with me, and I salute you all." Lawyers supporting Chaudhry told CNN they had walked some 10 miles Saturday to welcome him as he arrived at Karachi airport, having vowed to greet him "at any cost". All main city roads, including the road to the airport, had been blocked and sealed off with containers and trucks, police said, in what appeared to be a bid by government supporters to restrict movement and interrupt the rally. A provincial high court ordered the provincial government to provide security for Chaudhry on his visit. According to police sources, more than 15,000 police officers will be deployed in Karachi along with paramilitary troops. More than 800 political workers had been arrested, the sources said, adding that they were members of labor and student organizations who had planned to greet Chaudhry on his arrival. The police did not say why they had been arrested. The atmosphere grew tense and uncertain after gunmen opened fire on political workers of the opposition Pakistan Muslim League, killing six of them, police in Karachi said. Pakistan's Supreme Court bar and many legal experts have said Musharraf does not have the constitutional power to remove the chief justice from the bench. So far, 14 superior and civil court judges and two deputy attorney generals have resigned over the matter. Chaudhry was appointed to the court by Musharraf in 2005, but had recently started exercising independence from the government in a number of cases involving the disappearance of terror suspects and human rights activists. The U.S. has tiptoed around the matter, partly because Musharraf is a key ally in its war on terrorism. Musharraf's critics accused him of removing Chaudhry in an effort to intimidate the judiciary ahead of crucial elections and a vote in parliament to extend his rule later this year. On Wednesday Pakistan's Supreme Court banned the media from discussing the legal battle being waged by Chaudhry, saying coverage should not interfere with the process. The court issued the ban because of what it claims is a "campaign of making the honorable judges of the Supreme Court/members of the Supreme Judicial Council controversial" in broadcast and print media. Journalists' organizations launched a protest against the ban, with reporters saying they were merely covering the story and have done nothing illegal. In a statement Wednesday, the Supreme Court said special passes would be issued for reporters and lawyers to attend Chaudhry's hearing on the presidential reference filed against him. It added that media coverage, discussion and analysis that impeded legal procedures would be treated as contempt of court. Chaudhry's lawyers protested the decision and said they would challenge it in the Supreme Court. 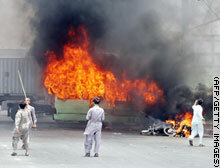 Pakistani opposition parties activists gather in front of burning vehicles after clashes erupted in Karachi.